Awards being announced by Amy Fischbach and Roy Harris in Kimmel Center at NYU. ASBPE honored Restaurant Business and FSR magazine as Magazines of the Year for 2015 and named Hotel News Now as its Website of the Year. The organization of business-to-business editors chose Computerworld as winner of its award for Best Cross-Platform Package of the Year. Related: Join ASBPE for a case study webcasts Aug. 12 featuring the Website of the Year team and Sept. 2 featuring the Magazine of the Year teams. 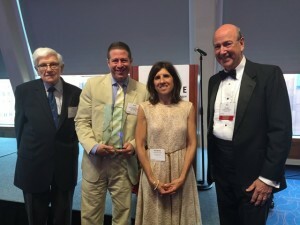 ASBPE’s Stephen Barr Award, its top individual feature writing prize, went to Ann Marsh of Financial Planning magazine for her May 2014 article “Could Financial Planning Help Stem the Rate of Military Suicides?” The story detailed a surprisingly high percentage of military and veteran suicides in which financial concerns, rather than combat trauma, were the main factor. Her description of how the Defense Department didn’t allow its financial planners to provide actual assistance, but only to give generic advice, was a factor in Congress passing legislation to move toward correcting the situation. Read more about Ann Marsh’s Stephen Barr Award. Accepting the Stephen Barr trophy for Ann Marsh, her editor Scott Wenger. From left, Stephen Barr’s father Charles Barr, Wenger, Stephen’s sister Vivienne Braun, and award presenter Roy Harris. 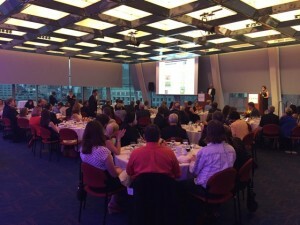 The ASBPE honors, in Digital and Print categories covering both editorial and graphic design, were presented as part of its thirty-seventh annual Azbee Awards of Excellence at its National Conference, held July 24 at the New York University’s Kimmel Center for University Life. ASBPE, which represents 600 journalists for B2B, or “trade publications,” was originally known as the American Society of Business Publication Editors. The single biggest winner of Gold awards in individual Print, Digital and Graphic categories was Computerworld, which earned eight. Realtor, Engineering News-Record, InvestmentNews and Exhibitor earned three each. This year 1,272 entries were submitted in 82 categories, slightly up from last year. A full list of winners of 2015 Azbee Awards is available here. Also acknowledged at the ceremony was Amanda Panacci, a journalism masters student at Toronto’s Ryerson University, who received the Student Writing Award offered by the ASBPE Foundation and the Association of Educators in Journalism and Mass Communication. Read more about the Student Writing Award winner, Amanda Panacci. ASBPE also named three Young Leader Scholars: Lauren Alexander, a freelancer for Meister Media Worldwide; Katie James, an assistant content specialist for UBM Life Sciences; and Jeff Zagoudis, an associate editor at Scranton Gillette Communications. Learn more about the three 2015 Young Leaders. Restaurant Business was honored as Magazine of the Year among publications of more than $3 million revenue. Honorable mentions in the category went to The American Lawyer and Governing, with Architect, Automotive News, CIO, DTN/The Progressive Farmer, Exhibitor, Human Resource Executive and InvestmentNews filling out the Top Ten magazines. In the category for publications with revenue less than $3 million, honorable-mention recipients were ABA Journal and Emergency Management, and Affordable Housing Finance, Connect, Design:retail, The Meeting Professional, Oregon Business, Stitches and Wearables rounded out the Top Ten. In the Website of the Year competition, Engineering News-Record’s ENR.com site and NetworkWorld’s networkworld.com site won honorable mentions. Filling out the rest of the Top Ten were americanbanker.com, autonews.com, computerworld.com, farmindustrynews.com, spectrum.ieee.org, SCMagazine.com, and WardsAuto.com. Among the awards in individual Print categories, both Gold and Silver awards for Feature Series went to Hospitals & Health Networks, while CSP and Civil Engineering won for General-Interest Feature and Long Term Living won for Case History and CIO and strategy + business won for Company Profile. Wearables won for How-To Article, and Engineering News-Record and McKnights’s Long-Term Care News won for Individual Profile in the large publication and smaller publication category, respectively. Among others winning Golds were Corporate Counsel for News Analysis; Farnborough Airshow News for On-Site Trade Show Coverage; Stitches and Computerworld for Original Research; Engineering News-Record for Technical Article; and dvm360 for Visual Storytelling. In Digital categories, Computerworld.com and CIO.com were big winners, while American Banker won for Enterprise News Story. Realtor won for Video-Tutorial and Video-News, while TechRepublic won for Impact/Investigative. Best New or Relaunched Website honors went to Builder. Among the new media categories, Best App went to Military Officer Select, Best Photo Gallery went to SearchCIO, and both Best Video-Tutorial and Best Video-New went to Realtor. CIO.com and Solar Power World both were recognized for their social media efforts. Related: See who won in the 2015 Regional Azbee Awards.